Michael Joseph Jackson was an American singer, dancer, musician, philanthropist, and actor. He was born on 29 August 1958 in Gary, Indiana, and died on 25 June 2009 in Hollywood, California. 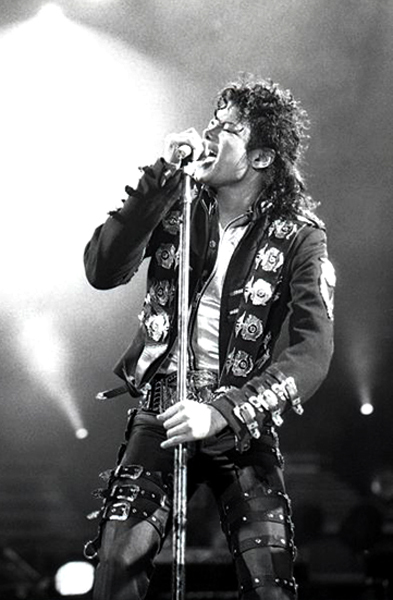 Referred to as the King of Pop, Rock and Soul or in abbreviated form as King of Pop, Jackson became "the most important rock star of the early 1980s" because of the success of his album "Thriller" (1982), the best-selling album in rock history. Jackson started his career in music at six years. He was a lead singer in a family band called The Jackson 5. This band played a variety of venues, including houses of ill repute. Other members of the band were his four brothers. Their young sisters Janet and Latoya sometimes sang with the band. Jackson accused his father Joseph of brutalizing him throughout his childhood years. Jackson married Lisa Marie Presley in May 1994. The marriage lasted less than two years and ended with a divorce settlement. There were no children. Jackson adopted three children he claimed were his biological children: daughter Paris, and sons Prince Michael and "Blanket". Jackson was known for his bizarre behavior. He lived with a chimpanzee who was allowed to use Jackson's private toilet. Jackson considered freezing himself for future generations, and attributed his noticeable skin color change to vitiligo rather than "bleaching". Jackson was infamous for his close associations with children. Some critics thought these friendships were abusive. He was tried twice for child sexual abuse, but settled out of court. He lived on a large California estate called Neverland, after the fantasy location in Peter Pan. The estate was filled with amusement park rides and a zoo. Jackson was planning a comeback tour called "This Is It" when he died of acute propofol and benzodiazepine intoxication on June 25, 2009, after suffering from cardiac arrest. The Los Angeles County Coroner ruled his death a homicide. His personal physician Conrad Murray was convicted of involuntary manslaughter. Jackson's death triggered a global outpouring of grief. A live broadcast of his public memorial service was viewed around the world. Jackson won multiple awards; 13 Grammy Awards as well as the Grammy Legend Award and the Grammy Lifetime Achievement Award; 26 American Music Awards, more than any other artist, including the "Artist of the Century" and "Artist of the 1980s"; 13 number-one singles in the United States in his solo career, more than any other male artist in the Hot 100 era; and the estimated sale of over 400 million records worldwide. This page was last edited on 21 March 2018, at 15:27.